◼ I have a monitored burglar alarm system, so why do I need NIGHTLOCK? A burglar alarm is just one layer of a comprehensive home security system. Burglar alarms do not keep intruders out of your home—and once an intruder is in your home, you and your family are in danger. The NIGHTLOCK is designed to keep intruders out of your home in the first place. ◼ Is the NIGHTLOCK easy to install or will I need to call a locksmith to install it for me? The NIGHTLOCK is very easy to install and use. Initial installation takes just a few minutes and securing the NIGHTLOCK when you go to bed at night is simple, just slide in the handle. Detailed installation instructions. ◼ I already have a deadbolt and a chain lock on my front door, so why do I also need NIGHTLOCK? Deadbolt and chain locks are only as good as the frames to which they’re attached. Most of these locks are attached to flimsy door frames and wood trim. This makes it easy for burglars to kick in the door regardless of the quality of the lock. But the NIGHTLOCK is anchored securely to the floor, literally barricading your entry doors shut and making entry door kick-ins virtually impossible. By using the power of leverage to secure the door, the NIGHTLOCK can withstand tremendous force and provide maximum home security. ◼ How much clearance is needed for the door to swing over the NIGHTLOCK floor plate? 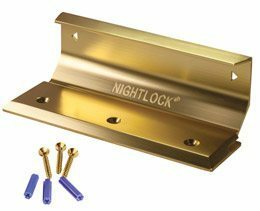 The NIGHTLOCK floor plate requires 1/2″ clearance for the bottom of the door to the floor. Be sure to measure this before ordering to avoid any issues.